At first glance you'd never guess that this bright bathroom floats on water. The shower doors in the master echo the casement windows throughout the houseboat. The lights pick up on the industrial feel, while the teak countertop and yellow cabinets warm up the space. 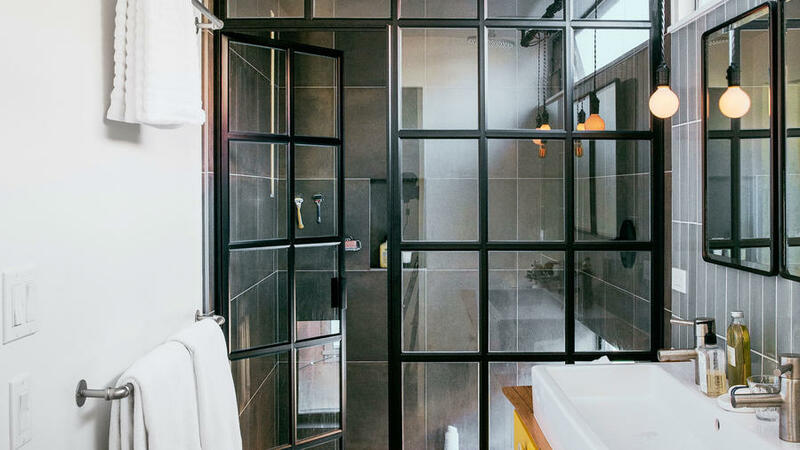 This Palm Springs master has a pocket glass door that converts the shower into an outdoor one. The walls are a desert-inspired Venetian plaster, which is meant to look like concrete. 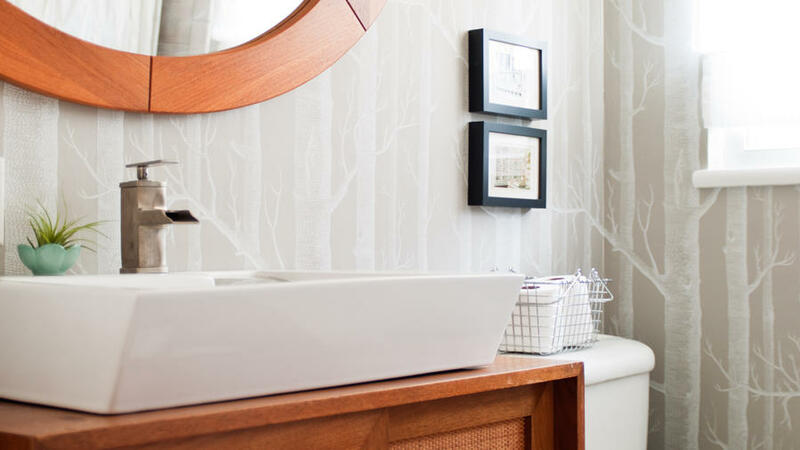 Colorful tiles create a loose, playful pattern in this guest bath­room. 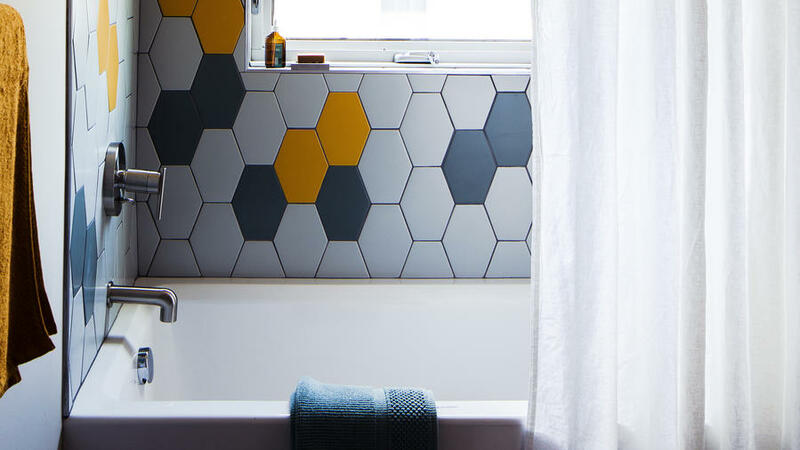 The hex shape adds a mid-century feel to the space without overshadowing the modern styling of the tub and fixtures. 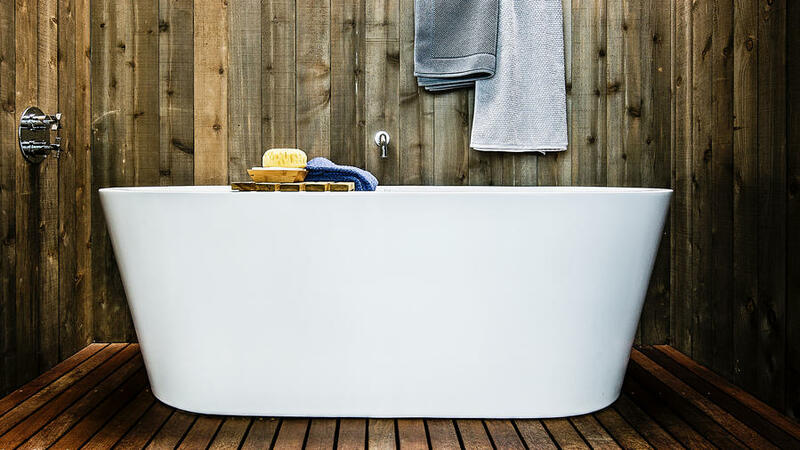 A ceramic utility sink from a salvage yard adds flair to this historic cabin's humble materials. 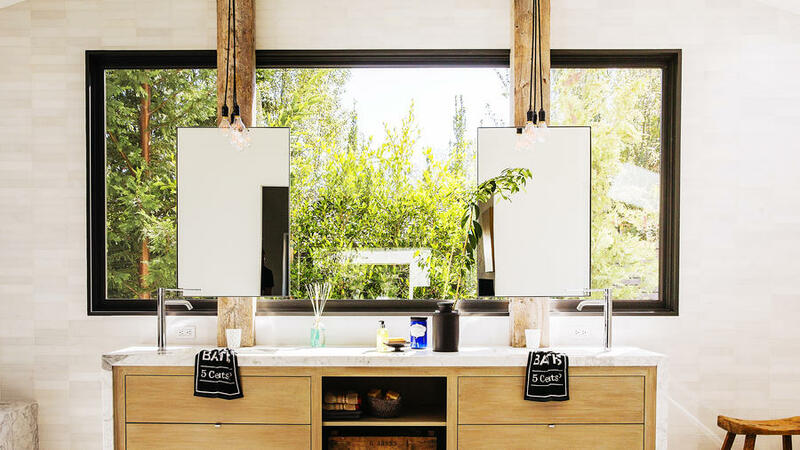 The sink nestles perfectly into a handmade vanity built out of wood from the property. A large sliding glass door, skylight, and cedar siding make this cabin bathroom feel alfresco without losing any warmth. This brooding winery bathroom pairs color-saturated walls with coordinating tile. The white counter, reclaimed wood, and lush plants (which get plenty of sunlight thanks to skylights) keep the space from feeling gothic or oppressively dark. a custom wood-and-cement surround and hexagonal tile to balance the A-frame's rustic bones with modern updates. 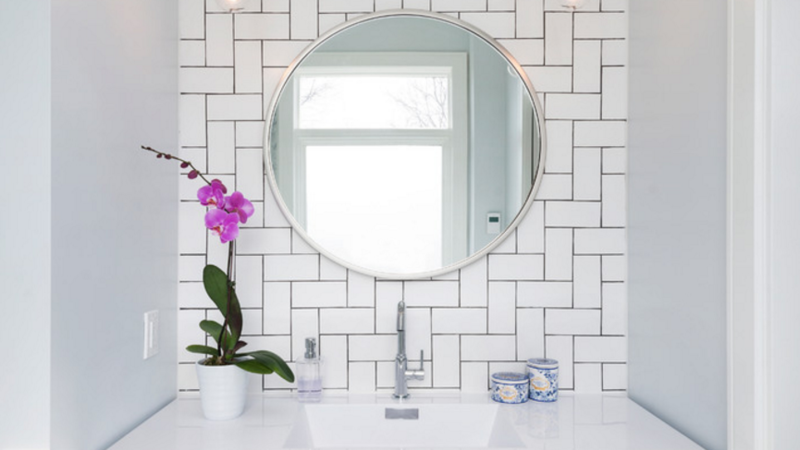 Who says subway tile has to lay horizontally? Turn the trend on its side by Interchanging horizontal and vertical tiles to create a graphic and modern accent wall. 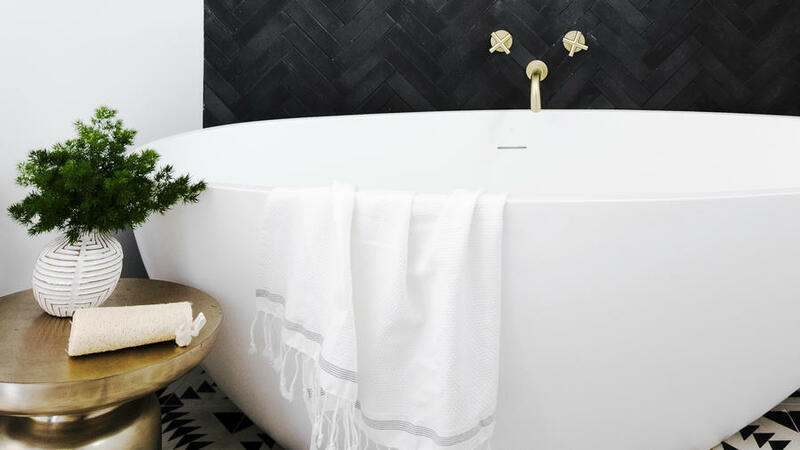 We can't get enough of this deep soaking tub paired with the black chevron tiles. You couldn't ask for a better place to soak. 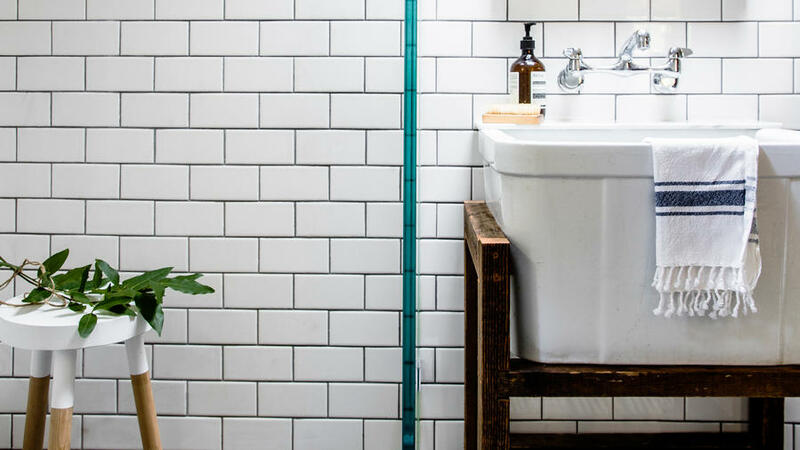 The kids' bathroom is tiled floor to ceiling with relatively low-cost subway tiles. 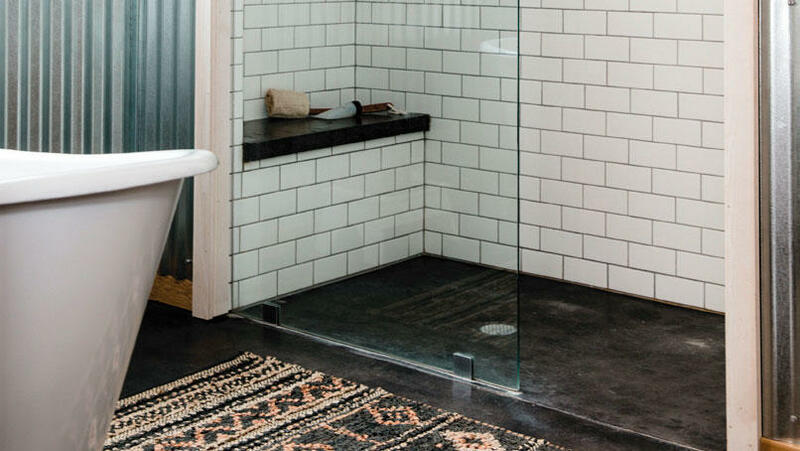 The larger size makes it easier to cover the space, while black grout emphasizes the scale. 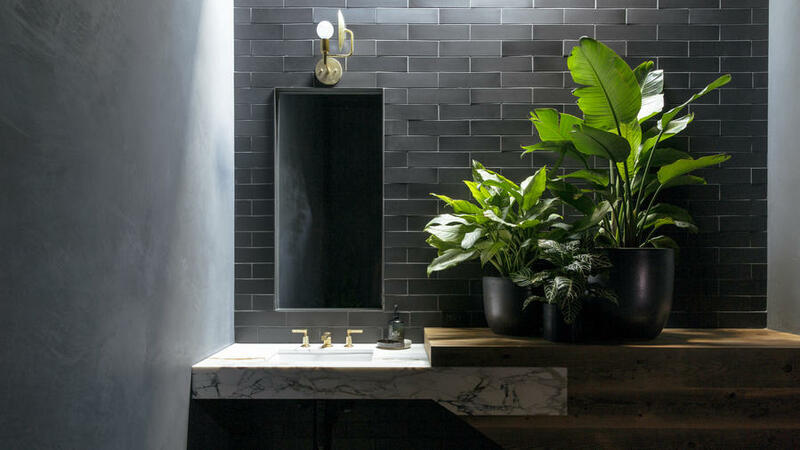 Embrace the industrial vibe of subway tiles by keeping the room palette black, white, and silver. 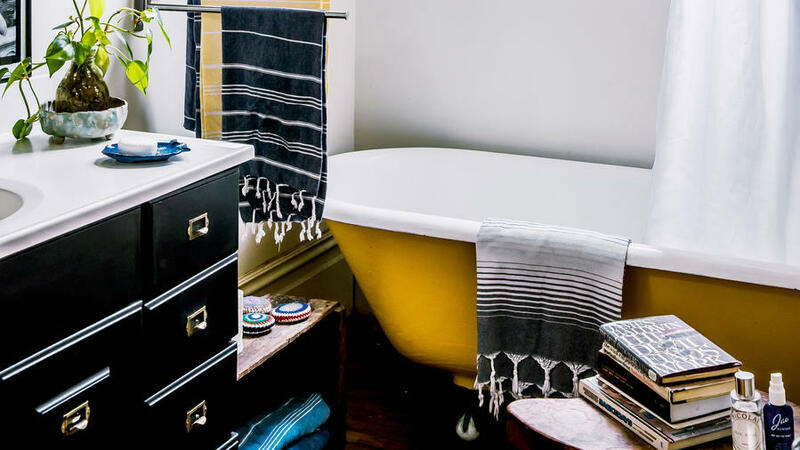 Utility hardware and materials like corrugated metal complete the look, and a large patterned rug serves as a bathmat and adds color and warmth to the space. What was once a Victorian-era “fainting room” is now a luminous space for leisurely evening soaks. 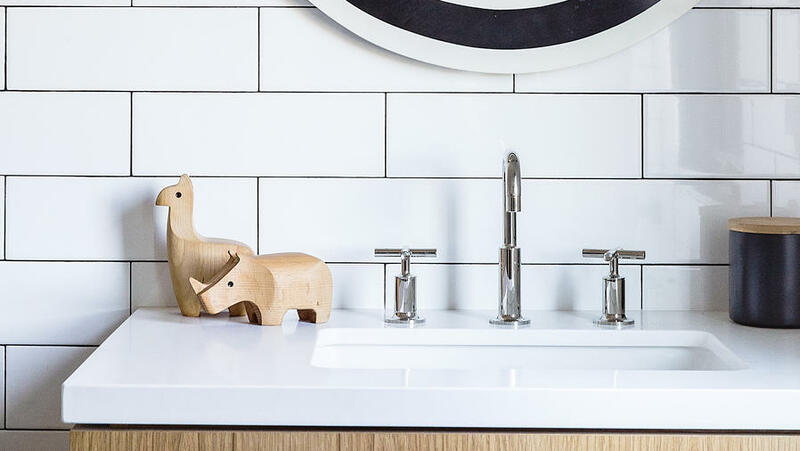 Strips of marble add a modern touch to a wall of mink gray subway tile. 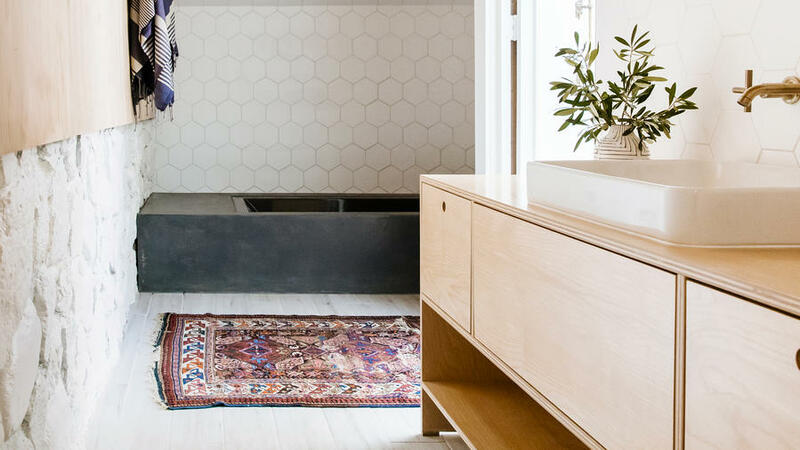 The old-fashioned sink was repurposed from the downstairs bath and moved into a room where it has more space to breathe. 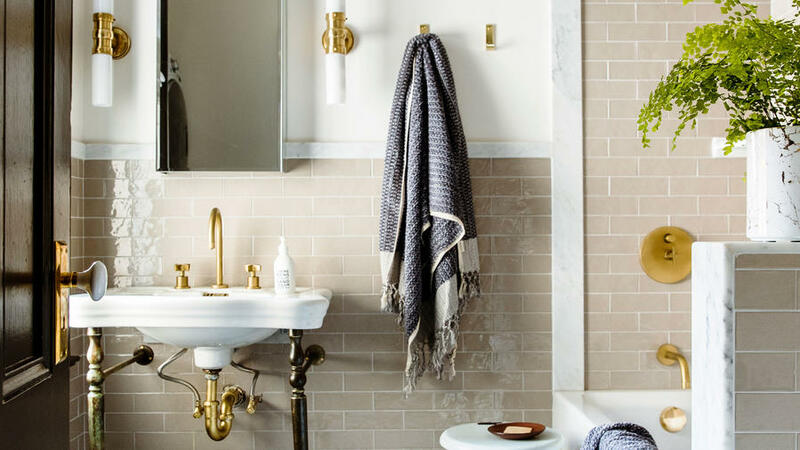 This bathroom’s ample light allowed for deeply toned tiles from Heath Ceramics. 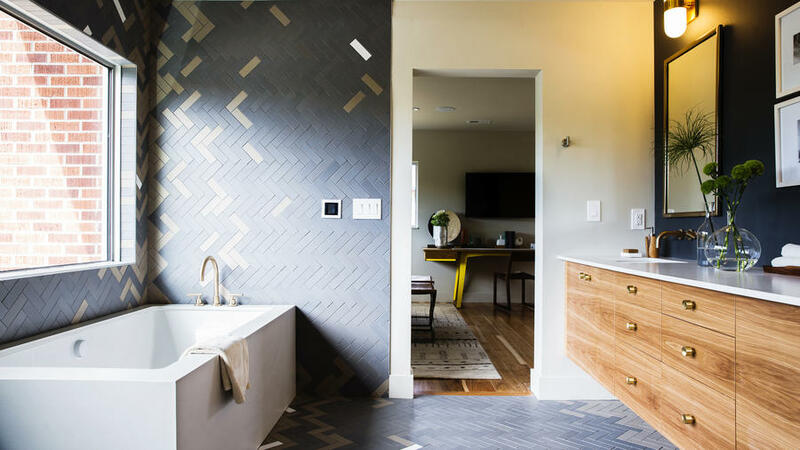 Designer Megan Hudacky of CKY Design added interest to the herringbone pattern by placing light tiles randomly and more densely around the edges of the room. Skylights and a generous window behind the vanity flood this master bath with natural light. Vertical wooden beams mask the pipes and make room for a mirror above each sink. The faucets are mounted on the sides of the sinks to make the vanity feel unique. Floor-to-hip-level subway tiles placed like wainscoting create a splash zone in this bathtub nook. When renovating this bathroom, the homeowners found a cabinet at a salvaged-building-materials outlet. It now houses the sink and provides additional storage.